It has long annoyed me that there is no intuitive, straightforward way to disable smileys in chat programs. Restart iChat. 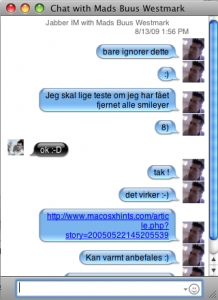 (tip from MacOSXhints.com: Disable graphical smileys in iChat 3.0 but it works for me on Mac OS X 10.5.8 with iChat 4.0.8 (619). Which reminds me that I better soon write a short article on the problem of having the wrong and obtrusive defaults in your applications. This entry was posted by Jesper Rønn-Jensen	on Thursday, August 13th, 2009 at 14:17 (GMT-1)	and is filed under OS X, Software, Usability. You can follow any responses to this entry through the RSS 2.0 feed. Both comments and pings are currently closed. that’s perfect! i didnt know how to remove the smileys, i really appreciate your post! it drives me crazy when people put more smileys than words in messenger, thanks for the solution! Would be nice if they could be turned off in all email programs too. Ok, I understand that in some instances they are just not required but there are those that genuinely love them and they can give a little levity to a boring day. But now there are ways to do it for those who can’t bear a smile! Don’t worry I wouldn’t even dream of trying to leave one here! I personally find the smileys a little annoying as well maybe because they are used so liberally. Now I know how to disable them on Yahoo and Ichat. How about on ICQ? Thanks for the useful information.